She keeps “Midnight Blue” company! they are a great pair. I am trying to get a sense of “Vintage”. Unfortunately, I have got no CLUE. someone sent me lots pictures and asked me to identify the Real “No. 1” Barbie & Fake “No. 1” Barbie, all of my answers were worng! how upsetting! I guess vintage Barbies are just not for me. that’s Okay, I cant love everything, modern dolls are more for me, from facial screening to fashion, they are more advanced. 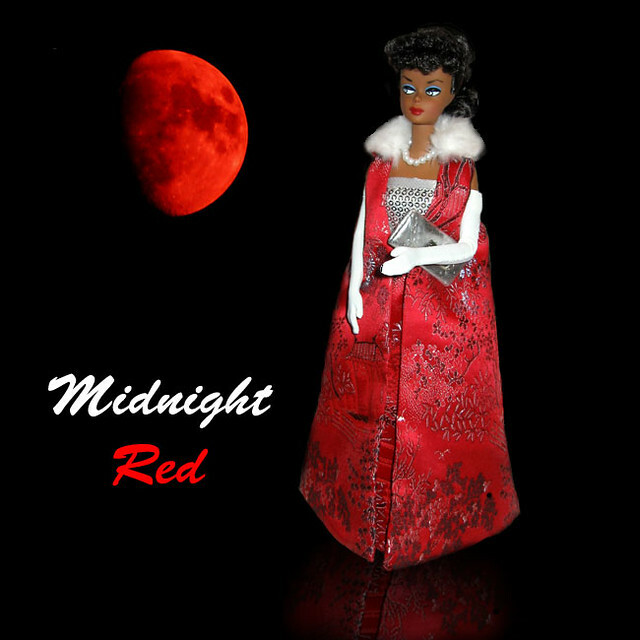 Here is a “vintage” doll I created. she was silkstone Trench Setter, Trench Setter isnt my favorite silkstone, so its okay to make changes. she was repainted from HEAD to Toe. what a torture! since I am not a “Vintage” girl, I wish to find her a new home. if you have any suggestions about how to make a doll look more like a Vintage, let me know. –I am really clueless. I painted this doll based on a barbie poster I have. whatever shown on the poster, I painted on her face.